Polls show Arizona Democrat Kyrsten Sinema’s lead over Republican nominee Martha McSally is rapidly shrinking in a key Senate race. Sinema’s lead in the U.S. Senate race has closed after news reports revealed her work with a hard left anti-war group that said the U.S. was waging “terror” in the Middle East. Sinema also said she wouldn’t object to Americans joining the Taliban to fight against U.S. soldiers. 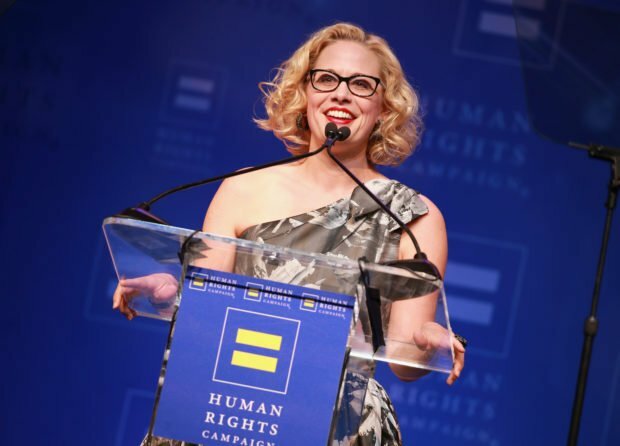 Past statements Sinema made about child prostitution laws and her home state of Arizona have also come under scrutiny. Arizona’s U.S. Senate race is tightening after news reports highlighted inflammatory statements Democratic nominee Kyrsten Sinema made about American soldiers, Islamic terrorists and child prostitution. Sinema once led Republican nominee Martha McSally by as many as eight points, but now is clinging to a lead of just half a point, according to the Real Clear Politics polling average. Sinema and McSally, who both serve in the House, are running to replace retiring Republican Sen. Jeff Flake. The race is considered one of Democrats’ best chances to flip a Senate seat in November. Republicans have also drawn attention to statements Sinema made that disparaged the state she now hopes to represent in the Senate. The Sinema campaign did not return an email seeking comment. “No one is forcing Kyrsten Sinema to run in a state that she thinks is ‘crazy’ and a ‘meth lab of democracy,'” Republican National Committee spokeswoman Renae Eze said in a statement to The Daily Caller News Foundation.